Savor 3 Exotic Delights at FOOK @ Jalan Sultan Ismail! 09 April 2019 09 April 2019 Categories General, TableApp, TableApp IdeasELITE Review, FOOK, Free Signature Dishes, Salmon Tartar with Quail Eggs and Caviar, Smoked Beef Brisket in Charcoal Bun, TABLEAPP ELITE, Wagyu Pho with Buckwheat NoodlesLeave a Comment on Savor 3 Exotic Delights at FOOK @ Jalan Sultan Ismail! 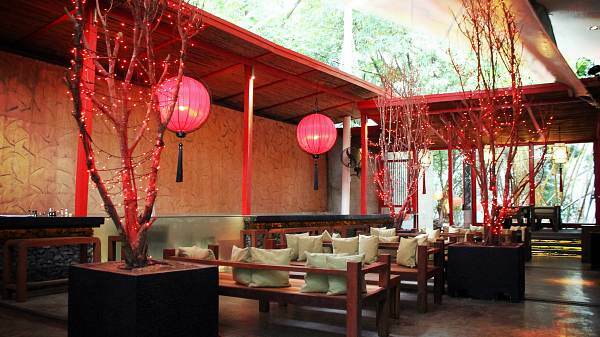 Set amidst lush green foliage right in the hustle and bustle of the city center, FOOK is the perfect dining haven for those who seek a short escapade. As one of the latest restaurants to join the expanding Modern Asian Dining scene in Kuala Lumpur, FOOK takes inspiration from East Asian culture and boasts an amalgamation of modernity and traditions in its interiors as well as foods and drinks. 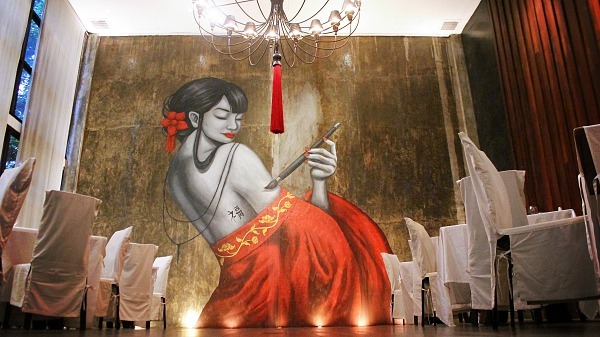 A stunning mural in the dining room. The restaurant welcomed us with a staircase lightened up by classic Chinese lanterns. Once we stepped inside, the Oriental decorations in the dining room made us gobsmacked and I was absolutely obsessed with the beautiful murals on the wall. Don’t forget to chill with a drink at the restaurant’s bar as well. Classic and cozy table setting. 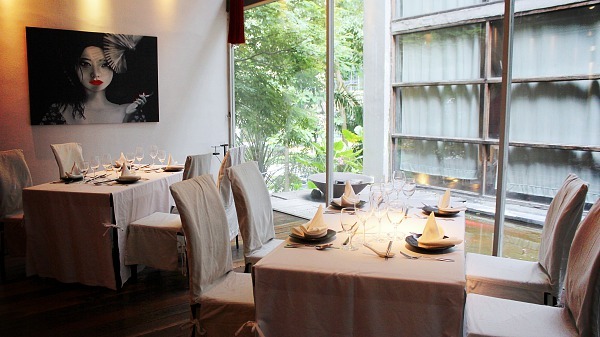 The restaurant’s contemporary chic look promised a meal of various flavors with a twist. As usual, I took this opportunity to reveal the top 3 dishes that are loved by the diners here! Don’t forget to read until the end as exciting news are awaiting you there! We decided to embark on our indulgence by treating the palate to something refreshing. 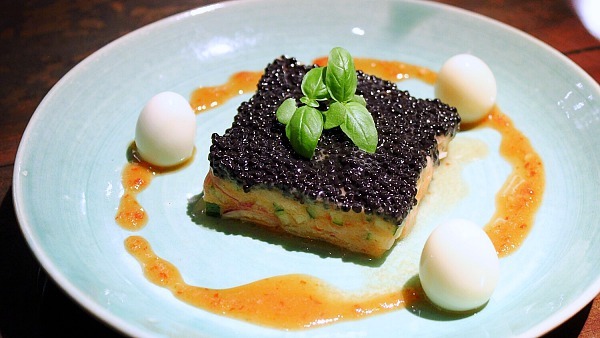 And this signature Salmon Tartar with Quail Eggs and Caviar quickly enticed us just by its appearance alone! As suggested by its name, the dish features quail eggs and salmon tartar using high-quality salmon mixed with finely chopped cucumber and shallot before being topped with a generous amount of imported Norwegian caviar. I took a spoonful of the tartar, mingled with the house-made Thai chili sauce, sweet basil and this exciting combination was rejuvenating enough to excite my taste buds. Here comes an interesting take on the classic Vietnamese Pho together with Japanese Soba – Wagyu Pho with Buckwheat Noodles. 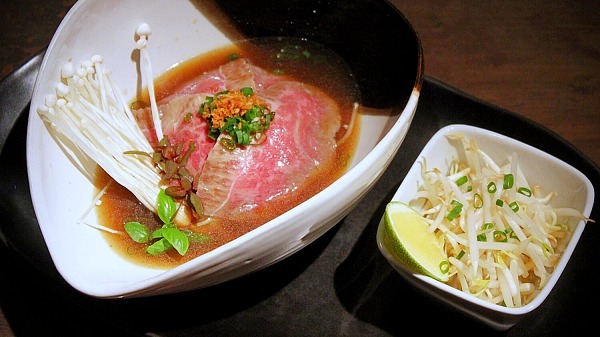 This signature dish is a ravishing reinterpretation of 2 cultures in one bowl. My eyes quickly fixed on the slices of high marbling Wagyu beef aesthetically put atop the buckwheat noodles. Pour the piping hot beef broth into the bowl and you can relish this magnificent combination. The melt-in-the-mouth Wagyu did not let me down at all while the buckwheat noodles surprisingly blended nicely with the broth. My small tip – quickly enjoy the bowl while it is hot to avoid the noodles being flaky! Finally, we ended our meal with the signature Smoked Beef Brisket in Charcoal Bun. I was amazed to know that it took 2 whole days to prepare this signature dish – the beef was marinated 1 day before being slow-smoked for another day! The beef was no doubt tender-to-the-bite as you can easily feel every strip of it. 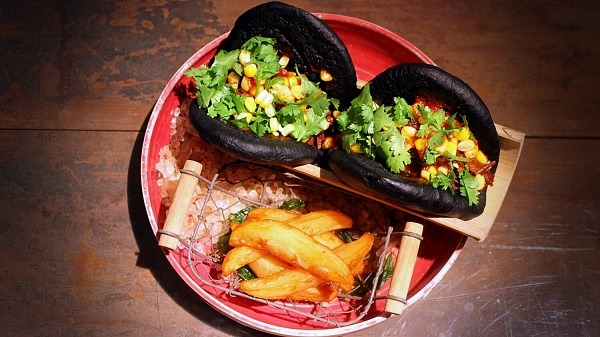 Its strong smoke-infused taste was then balanced by the sweet corn, parsley and house-made charcoal bun. A dish for those who love teasing the taste buds with intense flavors. TABLEAPP ELITE Members can redeem these 3 dishes for free. Find out more about TABLEAPP ELITE here. Location: 19, Jalan Sultan Ismail, 50250 Kuala Lumpur.